Version 4.5.5 will go online on Monday 1st December. For this latest release we’ve added a powerful new feature to help you find your content faster within the application. When working in a busy environment where multiple users and clients create content, trying to find specific content/records/data within the application can be time consuming. We’ve previously released features such as tags which have gone some way to address this, yet felt the experience could be further improved. With this upcoming release Spotlight search has been rebuilt from the ground up to allow you to find content faster and organize it more efficiently. The new Spotlight delivers one consistent location and experience for searching content within the application. It introduces new predefined filters that work hand in hand with search to surface relevant content faster. For instance you can now adjust your search by filtering via author, features used, date range or any combination of these. 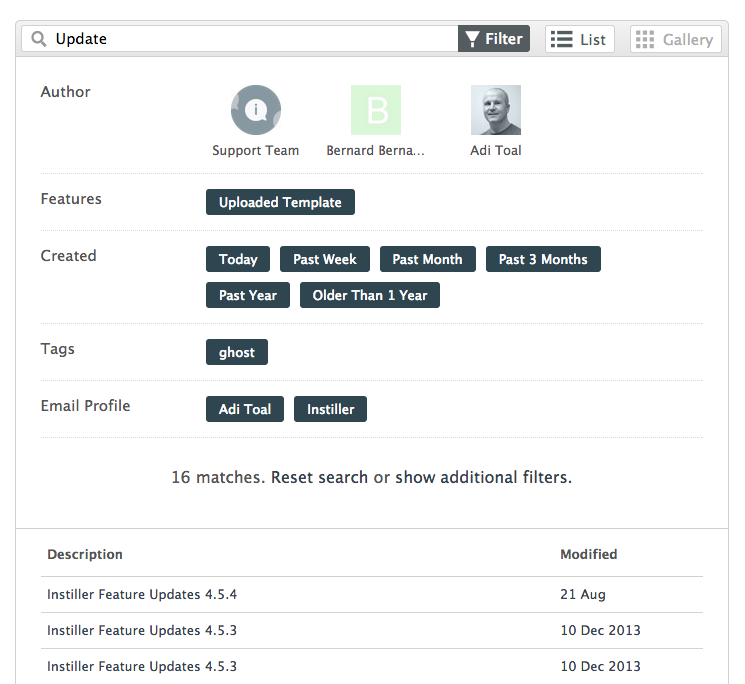 These intelligent filters take into account how your agency uses the application, removing unnecessary options and updating in response to user input. They’re incredibly effective at whittling large sets of data into manageable chunks within a few clicks. We think you’ll really like using them. With this new update the types of content you can tag has grown. 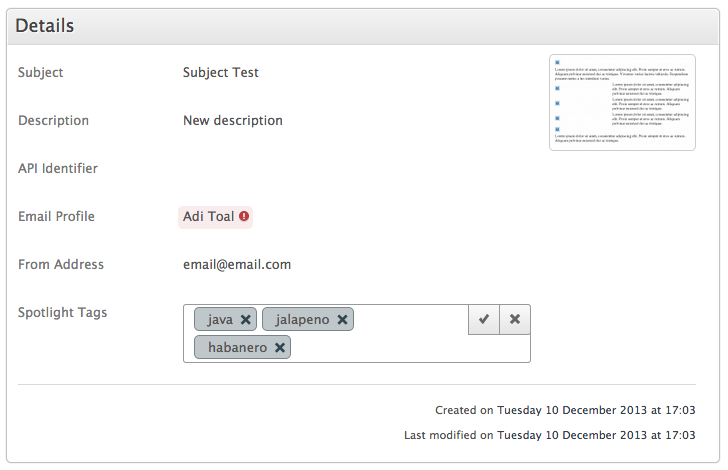 With more content accepting tags you can establish common conventions for grouping content within the application. Relevant tags you’ve created will show up in the filter panel, allowing you to quickly select them when searching. Additionally tags set on a template are inherited by campaigns that use that template, this lets you use the same search criteria when viewing campaign reports. We hope the new Spotlight makes you feel more efficient when using it, more knowledgeable about your content and encourages an organized approach to managing content within instiller. To add user defined tags navigate to the edit or create screen for your chosen content type and enter them in the Spotlight Tags field. Depending on which content type you’ve chosen either click the save changes button or the tick to the right of the input field to save your tags. Simply start typing in the search bar, results will automatically update when you stop typing. To run a more detailed search click the filter button to drop down the filter panel. Filter options can be toggled on and off and will update the results upon toggling. At any time you can see the number of matching results at the bottom of the filter panel. You may also see options to reset the search or show additional filters (if applicable). The additional filter section generally contains status or visibility filters. 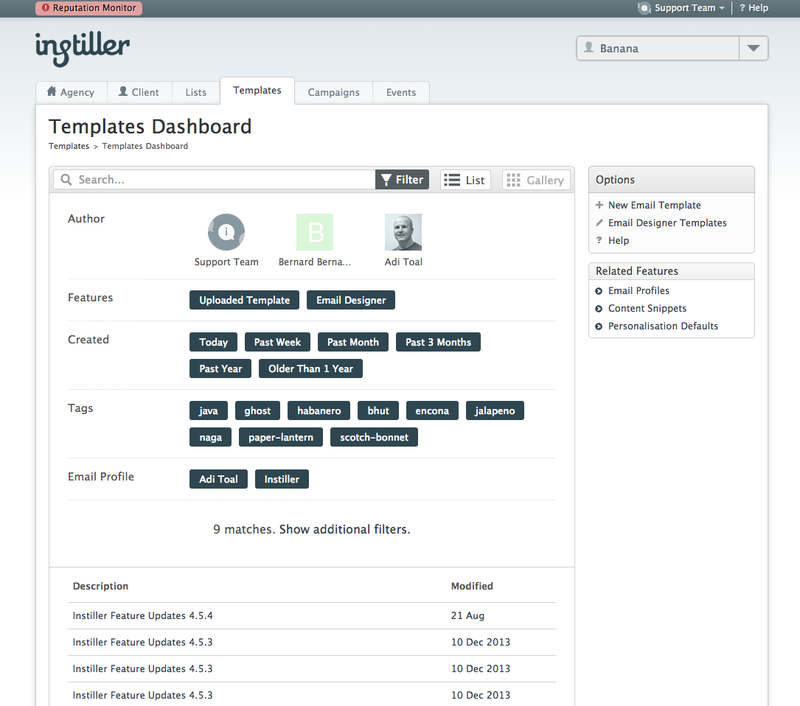 For the next release we’ll be adding an additional feature to our Email Designer – allowing you to create email templates for your client with control over the content blocks they can edit and/or customise. This will give you complete control over the design of your templates, while allowing your client to edit and amend only the content you specify.